While gutter cleaning is important to the well being and soundness of your home’s foundation, there are other precautions you can take to help protect the integrity of your home. If your gutter system is clogged, then water flowing over the sides of the gutters will land directly next to your house, erode the ground next to the foundation, and possibly even erode your foundation. Sinkholes under your home could cause a total or partial collapse rendering your home unlivable. Cracks in the foundation can cause water problems in your basement, which might lead to mold infestation. However, even if your gutters are working perfectly, these things could still be a problem if you do not properly handle your downspouts. The downspout is the section of gutter that travels down the side of the house and where the water exits the gutter system. 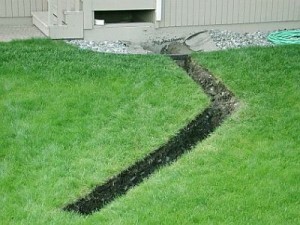 Typically, the downspout turns at ground level to lead the water away from your foundation. But that small redirection might not be enough because there is no way to guarantee the water will not run back towards the house. A small downward incline next to your house could spell disaster. One way to guarantee that the water will not make it back to your home’s foundation is to bury the downspouts. If you bury the downspouts and direct the water far enough away from the house then there will be no risk to your stability and foundation. Burying downspouts has another advantage in that you can use that water for various purposes. For example, you could direct the water to an outdoor vegetable garden and use it for irrigation. You can attach your downspout to a soaker hose that will also be buried. 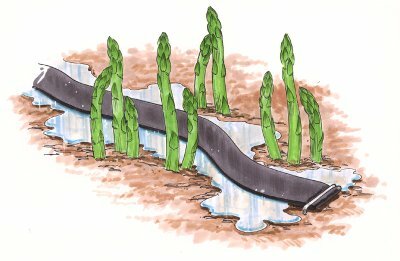 Then your vegetables or flowers will be watered at root level, which will help them thrive. Another reason you might want to bury your downspout is so that you can direct the water to a storm drain more effectively. If the water is left to saturate your lawn and find its own way to the storm drain, then you could have a soggy yard if you get a lot of rain in your area. Now that you know why you should bury your downspouts, you should know how to do it. The first step is to dig a trench where the downspout will go. The trench needs to start next to the house and end eight feet away. Next to the house, the trench should be about eighteen inches deep and at the end, it should be about thirty inches deep. Te downward slope will keep the water from running back towards your home. The entire tranche should be about fifteen inches wide. Line the trench with a piece of tarp that is two feet side and folded in half and one foot longer than the length of the trench. The extra foot should be at the end close to the house. Cover the tarp with gravel. Place the piece of draining gutter pipe in the trench so that the holes are facing down. Cover the drain piece with approximately three inches of gravel and then fill in with dirt. The dirt should be about three to four inches higher than the surrounding ground level. Walk on the soil to pack it down and let it settle for seven to ten days. Later you can fill in where you think you need more dirt.